Q: How are family owned ranches, farms and growers different than non-agricultural family businesses? 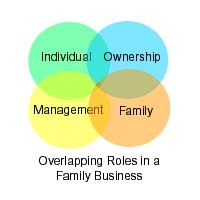 A: Agricultural-based family businesses have an additional burden not experienced by other types of family businesses---namely, all or most family members also live on the joint property (some may live on adjoining pieces). Typically that same property is often owned by the enterprise. Frequently there is little privacy between parents, siblings, cousins or in-laws. This most important 5th wheel---shared living space---can often inflame or constrain conflicts in the other four overlapping realms which family business owners must constantly negotiate with each other to stay successful, and at peace with each other.